Disneyland Adventures is an awesome adventure game from Frontier Developments, Asobo Studio. It allows fans of all ages to explore Disneyland park, enjoy adventures based on 18 popular attractions, engage in 100 challenging quests, and interact with 35 beloved characters. It is your ticket to the magical world of Disneyland right in your living room. Take a journey where stories come to life and dreams come true, right in your living room. Explore Disneyland park from Main Street U.S.A. to Critter Country, join Peter Pan to battle Captain Hook, high-five Mickey Mouse or hug Snow White. Step into adventures based on attractions, engage in challenging quests, and interact with beloved Disney characters. 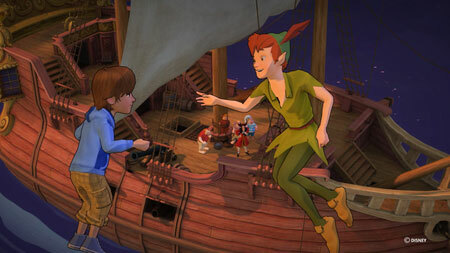 Fly with Peter Pan and defeat Captain Hook in Peter Pan’s Flight and ski the exhilarating slopes of the Matterhorn. Share magical moments with your favorite Disney characters, hug your favorite princess, collect autographs and accept quests. If you get stuck in the game, check out the video walkthrough and gameplay for the game. This entry was posted in PC Games, Walkthrough and tagged Disneyland Adventures Cheats, Disneyland Adventures Game, Disneyland Adventures Gameplay, Disneyland Adventures Guide, Disneyland Adventures Hints, Disneyland Adventures Review, Disneyland Adventures Solutions, Disneyland Adventures Strategy, Disneyland Adventures Tips, Disneyland Adventures Walkthrough by Marvin. Bookmark the permalink.